There was one small problem with that, though. 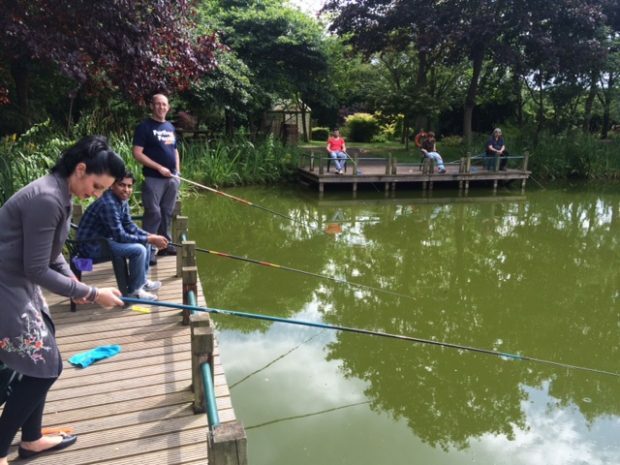 Our users are anglers, but most of us on the service development team had never picked up a fishing rod before. So we decided to do something about that. The more we thought about the phrase “be the user,” the more it filled us with dread. Beyond knowing we needed a licence to fish, and where to buy it from, we didn’t have a clue about angling. We had no understanding of the equipment needed, how anglers move it around, or where they buy it from. We had no idea what to wear. Trainers or wellies? We were clueless. We wanted to “be the user” but there was so much we didn’t know about our users. It’s so much more than just buying a licence and turning up. We started by talking to people. We asked anglers and the Rod Licensing team in the Environment Agency (our tester is an angler so he became our oracle), and we spoke to bailiffs who go out and check licences. Gradually, we found out some of the basics. We found out what to wear (for our purposes as beginners, a t-shirt, jeans and trainers would be just fine). The great thing was that everyone in the team was excited about going fishing. We were all keen to give it a try. And it was great fun! Almost everyone caught a fish and got an appreciation not just of angling and the experience both regulars and first timers have, but also of how to handle the fish once they’re caught. We learned to not remove their protective slime, the importance of removing the hook from their mouths, and getting them back into the water as quickly as possible. These insights will be helpful for us as we iterate the service further. It was a great day out. By making an effort to understand our users better, we’ve all come back with a new perspective of how their minds tick. The moral of this story is this: if you can spend some time to be your user, you should definitely go and do it. You’ll learn more than you expect, and come out of it with a much better understanding of what motivates your users. The better you understand your users, the better you’ll be at meeting their needs. Good insight Phil. It certainly emphasises the point about starting with user needs. Thank goodness the service is for a rod licence and not something like burials at sea! Thanks . Interesting about the need to be in the Users Shoes. Our pioneers … The Code breakers at Bletchley Park made great inroads in breaking the Enigma Code when they used insights. Each morning the Enigma operators had to use a pre code ( a bit like a password) to send the days messages. The pre code was meant to be random, but imagine what you might use if you were billeted in small hut, lonely, thinking when, how, will this war end for me. That’s right the operators used names of loved ones (!) and swear words for the pre code. Using this insight the enigma permutations reduced from billions to thousands and the primitive computer was thus able to decipher the code.